Wow, this book was a great read it truly was. It was definitely different from all the rest of the trading/investing books I have read. 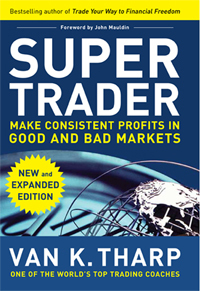 When I first came across the book, the words “super trader” caught my eye, well cause you know I want to be a super trader.. I picked it up and skimmed threw it and found it to be different from a lot of the trading books. This one focused on 3 topics, topics that I think are the most important and overlooked in the trading world. The topics were, the psychology or mindset of a trader, the trading plan one needs to be successful and position sizing. All of which he covered in great detail. This book was a very very easy read without to much jargon, it really kept you wanting to read more. Tharp is not only a very good investor but he also has a great wealth of knowledge in the art of NLP(Nero linguistic programming), which goes hand and hand when dealing with the thought process or the psychology of trading. He knows exactly what one goes threw when trading, exactly the thought process, the emotions, stress ect. The part dedicated to psychology was the longest and most in-depth, he really wanted you to figure you who you really are threw various questions he would ask, or exercises he would ask you to do. Now, it did take some getting use to when reading, on the fact most people would pick this book up and immediately expect to read about trading/investing or how-to’s ect. Not this book, this was strictly a book on honing in on the true details and foundation one must have in order to be successful in the markets. This section really was a life lesson on the thought process of an individual and he does tie it into trading psychology which makes it very unique and interesting. This has got to be the most over looked and undervalued thing regarding trading. A lot of other traders I have met never really sat down and drawn out a trading plan a guide to how this individual was going to trade and be successful at it. Most just want to get in and make as much money as possible, come to find out they become a statistic in the 90% of traders who lose money. Tharp hammers this into your brain that you must have one in order to be successful. He will also walk you threw and help you build one by asking a series of questions and jogging your mind about who and what kind of trader you are. This in turn will jump start your ability to write out a trading plan and actually following it no matter what! Out of all the topics I think this one really hit home with me, I truly got the most out of this section. I actually never realized the importance of position sizing and how it can effect your profits. I mean I know about it and i know what position sizing is, but not the way Tharp put it. He really broke it down and it explained it in great detail, aswell as giving you a formula to come up with for deciding your position in the market. ie: number of shares you should buy determined by the amount of risk you are allocating to the trade ect.. Now that does sound easy and I’m sure everyone does it but not like this. I guarantee he will open your eyes when he explains his method and the reasons behind it, it makes complete since. If you are looking for a how to book or a book to teach you how to trade or start investing, this book is not it and I would direct you to this one. On the other hand if you have found yourself struggling in the market or need some guidance or just want to gain insight on a different perspective of trading then this book is a must read for all skill types. I strongly encourage everyone to read this book!